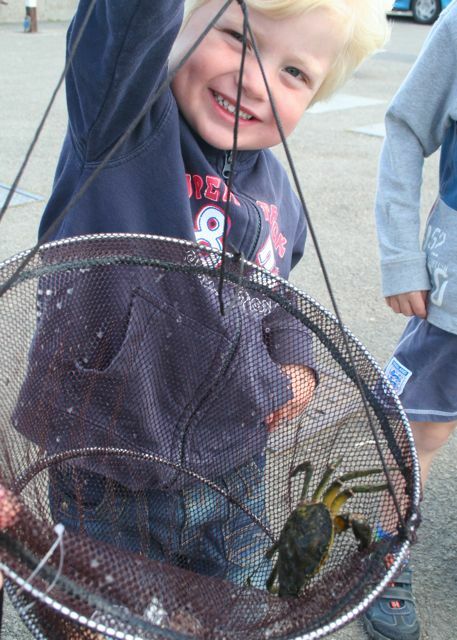 Crab fishing is one of those activities that most people did when they were kids and is hugely popular, but the days of a crab line with hooks attached are long gone, now its drop nets or mesh bags, welcome to Eco Crabbing! As I was on a weeks holiday with my family, and with a son really keen to have a go, we headed down to the harbour at Padstow. We arrived to find about 60-70 people already lining the harbour with their crab-lines out, it was quite unreal. 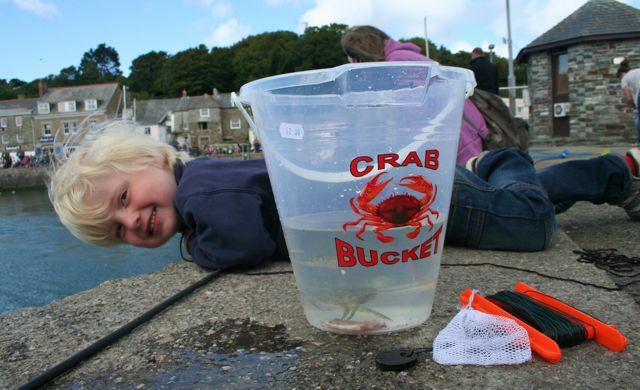 Crabbing is really popular! It soon became apparent that our crabline, with small mesh bag for bait, wasn’t going to work well here as lifting the crabs up such a high harbour wall would be a problem. Hoping that the crabs would hold on to the bag was wishful thinking. So after a quick look around we found a small fishing shop selling drop nets and fish bait, out came the pocket money and off we went to try again to catch something. We found a suitable spot, filled our bucket with water and baited our net with small pieces of mackrel. Lowering the net into the water we noticed small fish picking off little pieces of bait dispersing from the net. I gave my son a few tips on how long to wait, (like I really know! ), and after a few minutes he decided he wanted to have a look. The first time we pulled the net up it was empty, but we left it at the bottom a little longer the second time and brought the net up together. We were amazed to find a crab in it! What a great start! On the next net-lift we had quite a surprise, there were shrimp and fish in the net! Thats not what we were expecting, but it was great to see them up close in the bucket. My sons eyes lit up and I could even make an educated guess that we had a small horse mackerel and a mullet in our bucket! We carried on sending the net down, catching a fair few fish and shrimps, with a crab every now and then, and I could even leave my son in complete control of the net. Not bad for a four year old! He lifted the net and said it felt heavier, assuming that it was just the weight of the water he was lifting with his little arms, I told him just to carry on, only to see him lift a huge crab up over the harbour wall! It was definitely the biggest I saw that day. The crab suddenly scuttled off across the quay, quickly followed by us and a bucket. It was too big to fit in our bucket without making a meal of everything else, we put it back in to the water. Keeping a four year old interested in anything is a challenge, but this was really captivating him and I was really enjoying it too. We didn’t know what we would pull up next, and everyone on the quay was keen to share bait and help each other out, it was a nice place to spend a a few hours. We lowered our catch back in to the water, said goodbye to our crabbing neighbours and headed off for a well deserved ice cream. 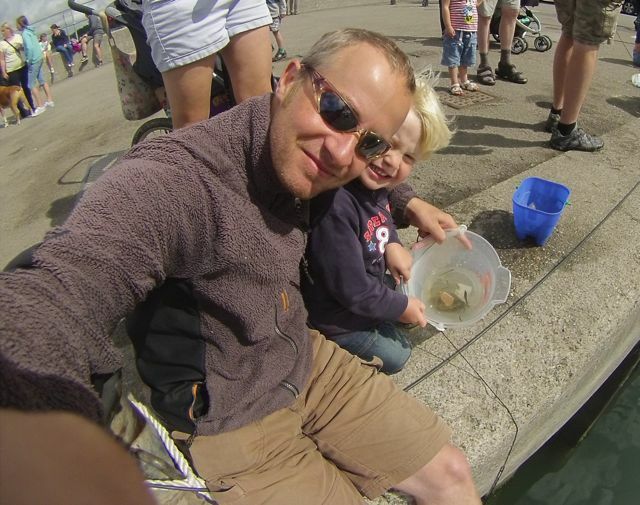 But we will be definitely be Ecocrabbing again very soon, not only was it great fun, but everything went back alive and unharmed (including our fingers)!